Qualification-12th class pass from a recognized Board or University + A typing speed of 35 word per minute in English or 30 word per minute in Hindi on computer. Age as on 01.01.2016 -Between 18 to 27 years.Relaxation as per Govt. rules. Application Fee-200/- is payable in the form of Bank Draft/Banker Cheque drawn in favour of "Secretary, NCERT" payable at New Delhi by.No application fee for SC/ST/PWD/Women candidates. Centre of Examination-New Delhi/Delhi,Ajmer,Bhopal,Bhubaneswar,Mysore and Shillong. Date of Examination: Examination may be held in May/June 2016. General Knowledge- 50 Marks ,General English- 50 Marks,Written Expression- 50 Marks (Descriptive type) (Hindi or English as per the choice of the candidate). 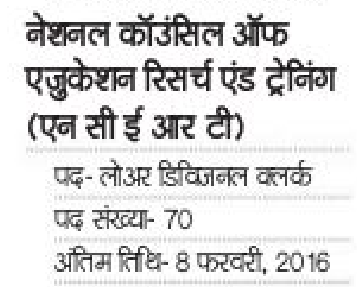 Last date for Hard Copy of application-22.02.2016. Attach self-attested photo-copies of certificates and mark-sheets of all examinations. Principal, Regional Institute of Education, Shyamla Hills, Bhopal- 462013. Address for application-Section Officer, R-II Section, NCERT, Sri Aurobindo Marg, New Delhi- 110016.